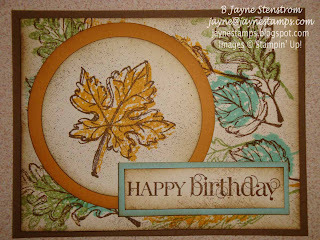 One of the card projects from my open house on Saturday was this card made with the Gently Falling stamp set. Everyone loved it! The "medallion" in the center was made using the Spice Cake DSP and the new Simply Scored Tool! I LOVE Stampin' Up! 's scoring tool! They took a lot of time researching and planning before they came out with their scoring tool. 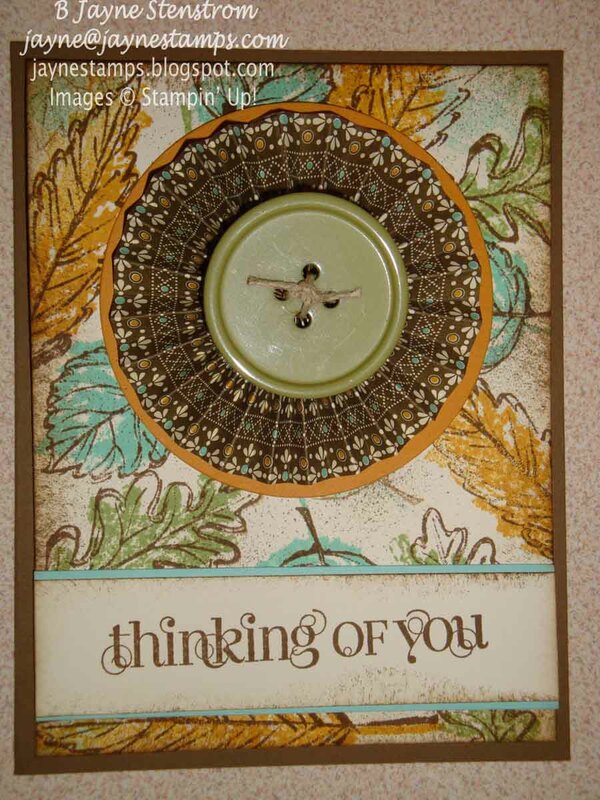 You can see it on pages 6 & 7 of the Holiday Mini Catalog. If you want any more information on it, contact me and I'll be happy to help! The colors from the card came from the Spice Cake DSP - Soft Suede, More Mustard, Pool Party, Pear Pizzazz, and Very Vanilla. 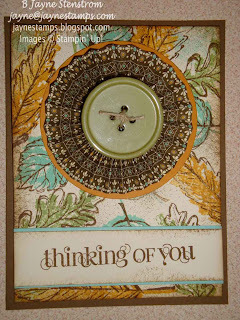 The medallion was placed on a 3" circle cut from More Mustard cardstock with the Bigz Die and then a Spice Cake Designer Button with Hemp Twine tied through the center was added on top. We also used the Curly Cute stamp set and added some additional interest by sponging and using the Color Spritzer Tool with a Soft Suede marker. I encouraged everyone to stamp a little something on the envelope. Sort of like a teaser for what's inside. One of the ladies who came on Saturday had a birthday party that day for friend and she wanted to use this card for him. We thought that maybe the medallion looked a little feminine, so this is how we tweaked her card to look more masculine. Same basic card - just turned on it's side. All of the edges were sponged with Soft Suede (including the More Mustard circle and the Pool Party around the saying). She was quite pleased with how it turned out! This is one of those stamp sets that looks good every time it's used. I've seen lots of samples and I love each one! 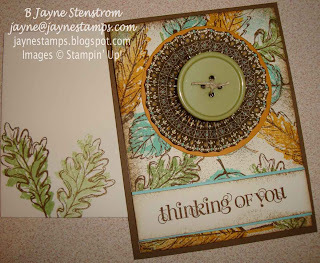 I hope you're inspired to get stamping and create something yourself! 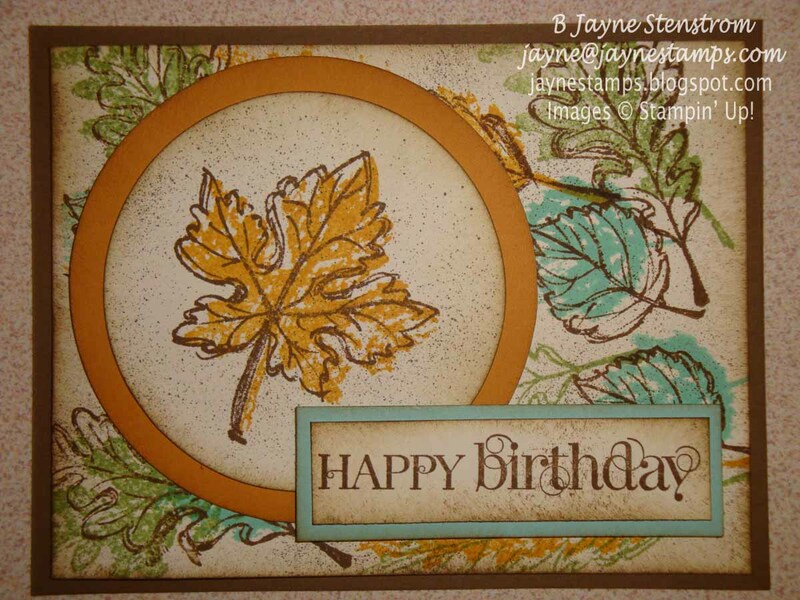 You can order any of these products that you've seen on my blog by going to my demonstrator website at http://www.stampinup.net/esuite/home/jaynestamps/ and clicking on the "Shop Now" button at the upper right hand corner.